They played a game which they rotate a wheel disk in turn and the person whom the indicator aims at must answer a question. No matter what the question is he/she must reply or else he/she has to drink vinegar. 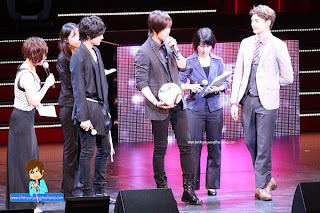 The indicator pointed at Kim Jun and Hyesun asked him, “When was your last kiss?”. Kim Jun couldnt answer and had to drink vinegar^^. 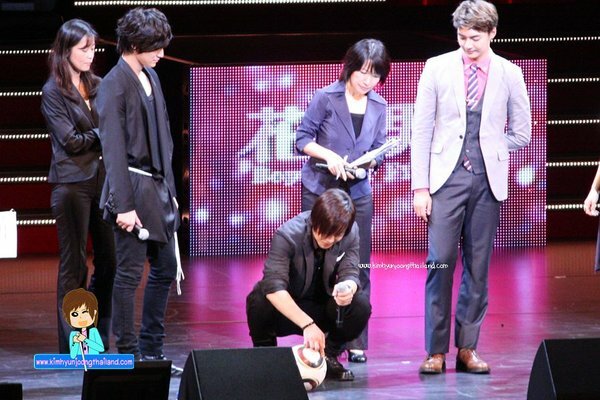 The 4 of them all drank vinegar at least once since all the questions were really mischievous. Hyesun, “For the sake of my new drama, I decided to cut my hair. In addition, am also settling some matters regarding some short film movies”. [Q] What kind of role is it this time? [Q] So did you prepare any musical practices? Was it tough? [Q] Hmm musical….I think Kim Jun has experience…? [Q] How do you feel hearing that? 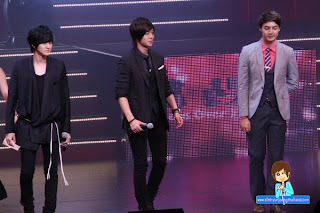 [Q] Hyun Joong!!!!!!!! Heard that you’re challenging a high-school student role again? [Q] So in order for you to look more like a high-school student, what preparation did you do? [Host] How do you feel when you look at it yourself? [HJ] In order to look more like a high-school student, I took alot of care on complexion. Because there are more outdoor shoots, so I had to take care of complexion more careful than usual time. Right now I’m still shooting for high-school days, in around episode 6, I will become a undergraduate (will shoot for uni.days). [Host] So which areas of complexion management did you look into? 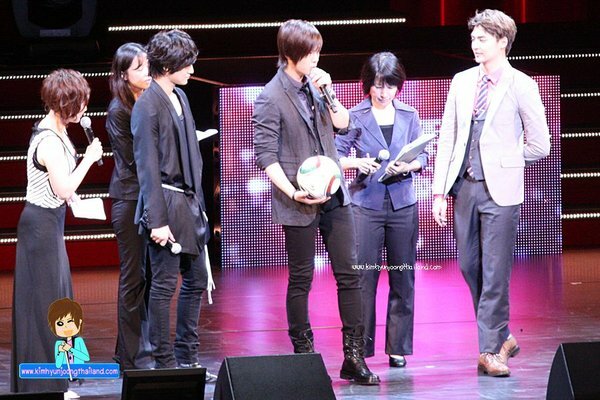 [HJ] Will go to kick football with dancers at dawn (sunrise). After sweating alot, I used cold water to cleanse my face, that can help to reduce pores. Began to air the video, everyone was watching together. Suddenly…..a rouse of laughter was heard coming from the mike…..who was it? 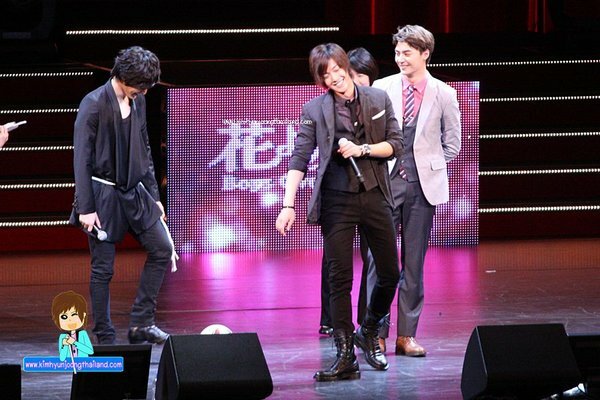 [Q] Why laughed so happily? [Q] Heard you put on weight? [HJ] Yeah because back then we shot in very cold weather. Hyesun told me about wrapping dyna paper on ourselves, it can help to keep heat. But during my free time, I was basically always sleeping. Because after you finish wrapping we still have to remove it for shooting, so I didnt really try it out. [HJ] Wrap the entire body…but whenever there were free time I went to sleep, though I knew it was a good way, but I didn’t try it at all. [Q] Hyesun told you, so that means she tried it before? [HS] Yeah. Many actors try that too. Whenever it’s cold weather, and during rainy days. [Host] This BoF event is already the 4th event, so basically every question we wanted to ask have all been asked, so! We decided to set up this game! The wheel turns…and whoever the indicator points to, that person has to answer any question at all no matter what it may be, if he/she cannot answer, he/she drinks vinegar. [Q] Your embarrassing moment in front of friends? [HJ] My parents obviously moved house already, but because I drank alcohol, so I forgot about it and went back to the old address. [Q] Does Hyesun have any embarrassing moment? [HS] When I drink I’m very shy (??) Why?? [Q] Heard that Hyesun has some good liquor? [Q] Heard that you can drink really well? [HS] I’m shooting a new drama ow, hopefully this drama will be shown in Japan as well. I’ll work hard. But to be honest, I guess it’s because this song was too hard to sing…? On the screens showed her PV of the song too! They sung the most. Because SS isnt here? But if I were to come into contact with Kim Jun it’ll be more satisfying… They danced too? Their singing was not bad. 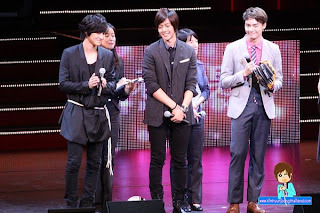 Finally was HyunJoong. First was Thank you, then Please be nice to me, 2 songs. Was I the only one who felt his voice was a little weird, or…?? His outfit looked like June’s manila event…?? HyunJoong’s hairstyle was actually straight in the afternoon session, after wards was curled when he came out to sing! Then for his night session…his hair was curled already, when he sung, he revealed his forehead? Like those regent hairstyle. 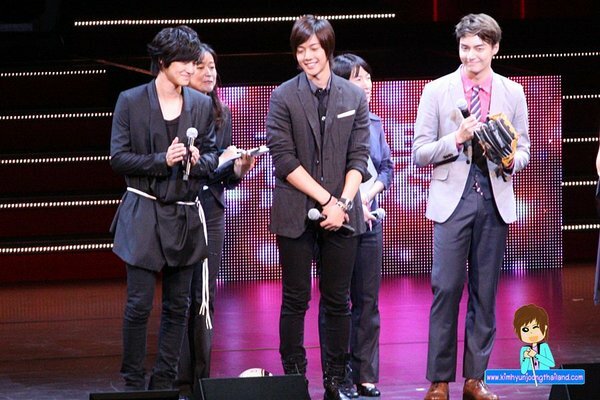 At first, all 4 of them went on stage together… “Eh, where’s Hyesun, didn’t come?”. Everyone’s face was soo small…so thin…I was quite taken aback. And!! Photography and video was allowed too!!!!! So no choice I bought a HyunJoong poster. Very happy this time…I want to go again!!! I laughed when Leader talked about his most embarrassing moment. Forgetting that his parents moved to a new house and went to the old address because he was drunk, hahaha! So 4D. And I loved when he said high-quality ALBUMS. 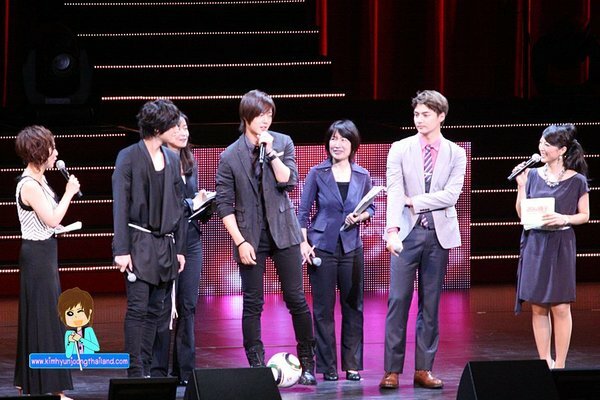 Being part of SS501 is definitely still a part of his aspirations. 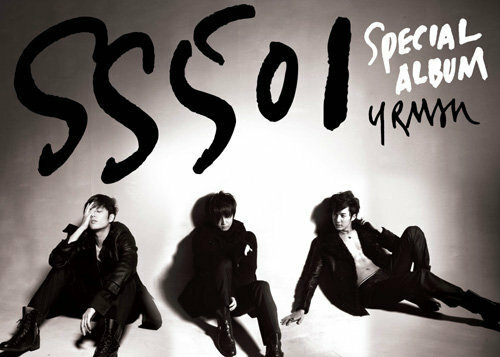 Can't wait for the 2nd full SS501 album!